Internet activists are hoping to “break the internet” on Tuesday to show their opposition to the Federal Communication Commission‘s (FCC) plan to repeal net neutrality rules later this week. Fight for the Future, an internet rights group, is organizing a “Break the Internet” protest that will encourage social media users to make “creative posts” to bring attention to the FCC’s plan to repeal net neutrality rules, a founding principle of the internet that ensures all internet traffic is treated equally. The protest calls for people to post on Twitter, Instagram, Facebook, LinkedIn, YouTube, Vimeo, or their own personal website to try and get “*everyone’s* attention and drive phone calls to Congress.” The protest website also offers instructions on how to call representatives in Congress to voice opposition to the FCC’s scheduled vote. On Dec. 14, the FCC is scheduled to rescind the 2015 Open Internet Order which prevents internet service providers from restricting access to content or slowing down some websites in favor of others. Net neutrality rules, for example, prevent a company such as Verizon from blocking or slowing down Netflix in favor of their own streaming service. In addition to pushing for users to post on social media, websites such as GitHub, Reddit, Imgur, BitTorrent, PornHub, Deviant Art, Etsy, Mozilla, and Pinterest are “already working to drive calls and messages to Congress” in order to “stop the FCC,” according to the protest’s website. Internet users are also asked to get “creative” by, for example, changing their job on LinkedIn to “Defending Net Neutrality” or saying they’re “married to the open internet” by changing their relationship status on Facebook. Earlier this year another major online push to protest the FCC’s net neutrality plans, the Internet-Wide Day of Action To Save Net Neutrality, brought together internet activists, major technology firms, internet startups, and everyday users where “tens of millions of people” saw ads, images, and other material warning what the internet would be like without net neutrality. 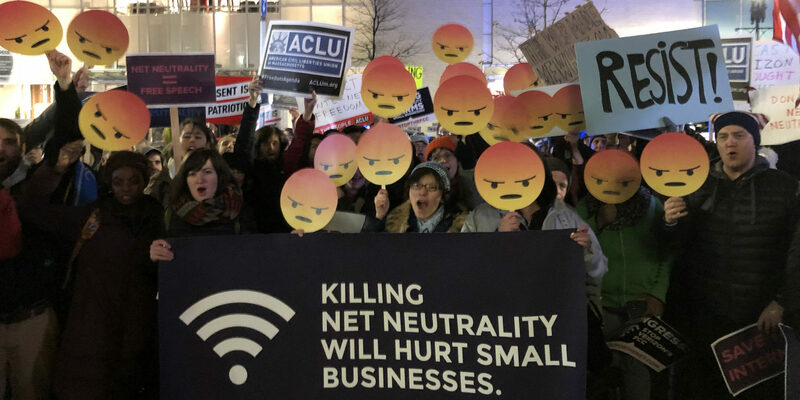 The Internet-Wide Day of Action To Save Net Neutrality resulted in more than 2 million people submitting comments to the FCC—nearly tripling a number of comments left during the 2014 “Internet Slowdown” protest that pushed the FCC to establish net neutrality protections. You can read more about the “Break the Internet” protest here.